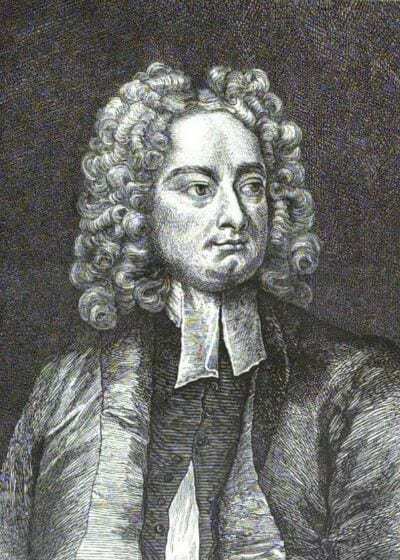 One of the great writers of English, Jonathan Swift (1667-1745) was plagued for much of his life by bouts of giddiness, and by increasing deafness, though in many other respects he was healthy and lived to the age of seventy-seven. It sometimes incapacitated him for long periods. About two hours before you were born, I got my giddiness by eating a hundred golden pippins at a time at Richmond, and, when you were five years and a quarter old, baiting 2 days, I got my deafness, and these two friends, one or other, have visited me, every year since: and being old acquaintances, have now thought fit to come together. It seems to have begun when he was twenty, according to the autobiographical notes in Forster’s biography (p.27), but there, there is a footnote inserted that says Swift had added, “in 1690.” The word ‘hours’ in the letter to Henrietta Howard may be an error for, or misreading of, ‘years,’ or it could be he had forgotten precisely when it happenened. Bucknill (p.495-6) quotes Swift’s ‘Journal to Stella’ for October 1710: “This morning, sitting in my bed, I had a fit of giddiness; the room turned round for about a minute and then it went off leaving me sickish, but not very. I saw Dr. Cockburn to-day, and he promises to send me the pills that did me good last year; and likewise has promised me an oil for my ears, that he has been making for that ailment for somebody else.” The diagnosis seems to be that he had Ménière’s disease (see Bucknill and Bewley). Non clamosa meas mulier jam percutit aures. DOCTOR: Deaf, giddy, helpless, left alone. ANSWER: Except the first, the fault’s your own. DOCTOR: To all my friends a burden grown. ANSWER: Because to few you will be shewn. You may have company enough. Than if it rang out for my knell. ANSWER: Then write and read, ’twill do as well. Than at the rumbling of a cart. ANSWER: Think then of thunder when you fart. DOCTOR: Nay, what’s incredible, alack! No more I hear a woman’s clack. That does, I own, increase my wonder. Although he lived to a good age, Swift’s final few years seem to have found him the victim of what Bewley calls, ‘terminal dementia’ (p.604).